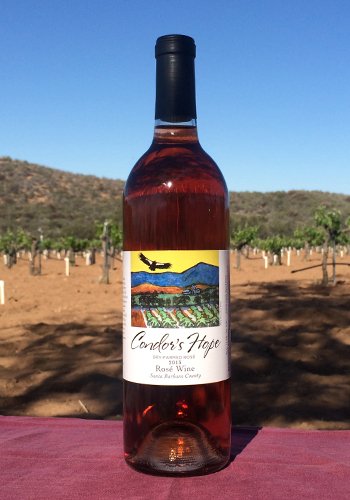 Blush blend of Zinfandel, Mourvédre, and Mission grapes crafted into a dry Rosé in the French tradition. Grown in Santa Barbara County. Winemaker: J.P. Pawloski of River Run Vintners. Our classic, dry rosé with a light strawberry finish is perfect to enjoy with friends on a summer afternoon. The blend features Zinfandel, Mourvedre and Mission grapes from our organically certified vineyard. The grapes in this Rosé were grown using traditional European dry-farmed practices, where high yield is sacrificed for high berry quality and intense water conservation. Enjoy with soft cheeses, salads, and picnic lunches. Only 70 cases produced. The grapes in this Rosé were grown using traditional European dry-farmed practices, where high yield is sacrificed for high berry quality and intense water conservation. With the fourth year of drought, our yield was very low and we did not have enough grapes to make our classic dry rosé blend. We were fortunate to find Zinfandel grapes from Wirz Vineyard in Cienega Valley grown in the same dry farmed, head pruned style as ours. Our winemaker JP Pawloski crafted these grapes to bring you this distinctive Rosé which is light on the tongue and a finish reminiscent of ripe strawberries. Enjoy with friends on a warm afternoon along with your favorite cheeses. A third year of drought yields this warm afternoon favorite. Harvested at a low brix produced a classic rosé, with nice acidity on the finish and the taste of summer fruits. Only 25 cases produced. Our "Dry-Farmed" Rosé - Strawberries and pomegranates are followed by a hint of spice on a smooth finish. Delightful with cheeses and appetizers. Our "Welcome" Rosé - This rosé begins with a smooth floral bouquet and a hint of hibiscus. Dry on the finish, enjoy with friendly lunches and leisurely picnics. Our wine club members are the backbone of our community. Join and enjoy rare wines from our cellar, special events, discounts, and more. © 2019 Condor's Hope. All Rights Reserved.